Tomato sauce should be simple, made naturally, and with no more than just the basics. 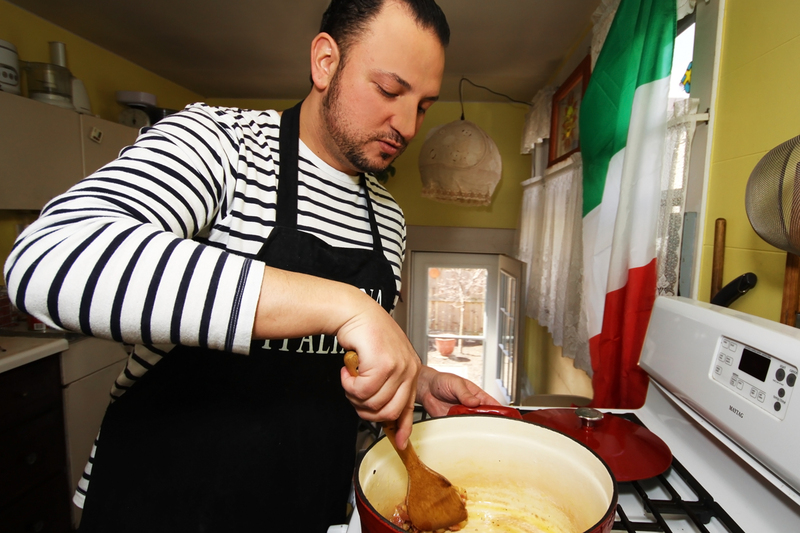 That’s what I’ve learned over the years from my Mother and Aunts when it comes to making traditional family ‘sugo.’ At a young age, I began watching over their shoulders – typically holding a piece of home-made bread, ready for dipping – learning the fundamentals and techniques of making my family’s authentic tomato sauce – pure flavors like garlic and basil that crown the intense flavor of the tomato, the star of the show. 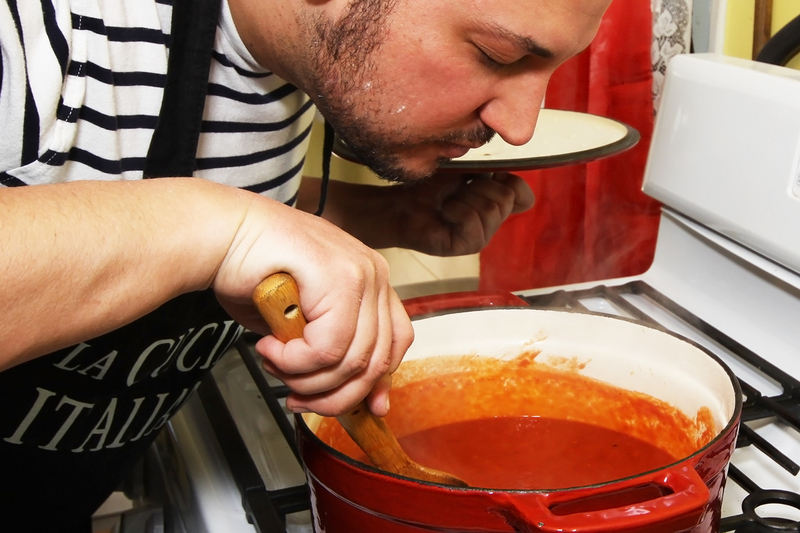 Cooking slowly for hours allows these flavors to marry intimately, reducing the acid and amplifying the sweet tang of the ‘pomodoro.’ I share with you not so much my recipe for sauce, but a timeless tradition that brings the entire family into the kitchen – the taste and aroma of a traditional tomato sauce is just that powerful. Yes, yes you do. One of the keys to great tasting sauce is cooking down the tomato slowly over low heat – this allows the combination of simple flavors to work with, but not overshadow, the robust tomato flavor. It also gives you time to enjoy those around you – sipping wine, eating cheese and fruit – talking, laughing, and waiting together for the sauce to be just right. Begin by reserving the tomato juice from the can of peeled plum-shaped tomatoes and save in a bowl. Using a food processor, puree the plum tomatoes until smooth. In a large sauce pot, heat 3 tablespoons of extra virgin olive oil over medium and add minced garlic. Sauté for a few minutes, being very careful to not burn or overcook the garlic (just enough time for it to sweat). Add the tomato juice, and heat for a minute or two before adding the crushed tomatoes and pureed stewed tomatoes. Continue heating over medium while adding the sugar, salt, pepper, wine, and water. Stir occasionally until near boil and reduce to low. Add the basil leaves (whole or rip into large pieces). Simmer, on low heat, stirring occasionally, for 2 ½ to 3 hours. Serve with your favorite pasta and BUON APETITO~! I could eat this every single day. Thank you for sharing your family recipe. I will do my sugo just like this next time…. You’re welcome! I hope you like it – let me know what you think! I have spent years trying to get it just right (aka, just like my Mamma’s), and I have finally done it. I know for sure because this past Easter, she allowed me to make the sauce for our family dinner ravioli. 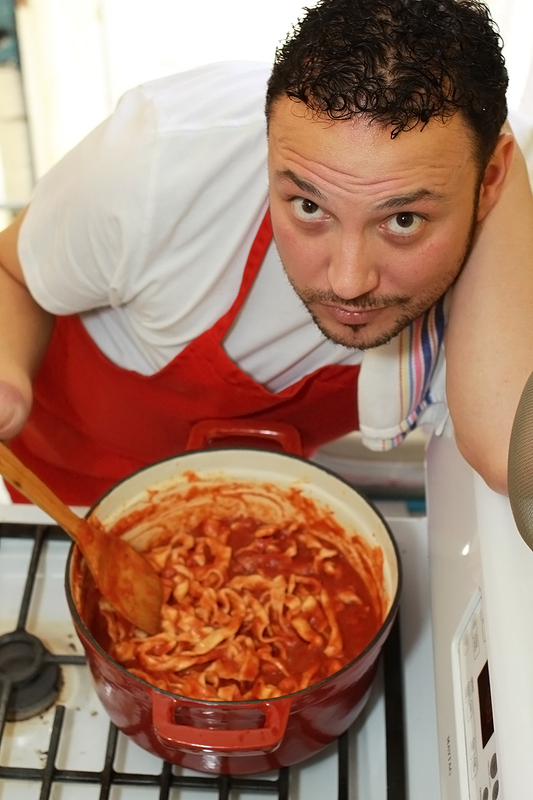 Carlo – do you cook meat in your sauce? Hi Tootsie! Yes, I do cook meat in this sauce, one of my favorites being boneless pork spareribs, cut into 2″ x 1″ pieces and season with salt – after adding the oil and garlic, brown the meat before adding the remaining ingredients. Cook for several hours, as indicated by the recipe, and you will have soft, tender, flavorful pork – old world style! I’ll be sharing my Bolognese recipe in the coming weeks, too! Your family tomato sauce recipe is delicious. It tastes just like the sauce my mother use to make that I could never perfect. I had sauce left over so the next day for something different I added heavy cream for a tomato cream sauce. If you have a meatball recipe you are willing to share I would love to try it. Thanks for sharing your family recipe. I love this recipe and ONLY use this one now-thank you! I graduated with your brother, Bob! Keep posting as I follow your posts and love trying your recipes. Love your music, too! Thanks so much, Sherry! Stay tuned for lots of new recipes coming soon. Happy 2016!